Armchair fiction presents extra-large paperback editions of the best in classic science fiction novels. 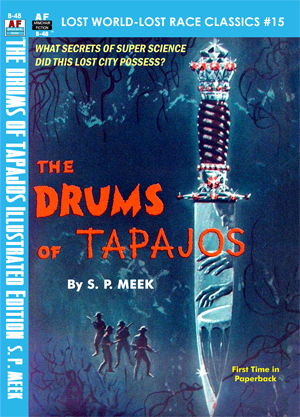 S. P. Meek's "The Drums of Tapajos, Illustrated Edition" is the fifteenth installment of our "Lost World-Lost Race Classics" series. Beware the bizarre jungle drums that signaled Death! After a boring stint in the army George “Dune” Duncan, Frank Nankivell, and Bob Mariston of the United States Infantry were looking for some new excitement. And Mariston knew just the man to help them out—soldier of fortune and revolutionary upstart, Ray Willis. Two years earlier Willis had stumbled upon a dying man in the jungle who muttered undecipherable phrases. From this human wreck Willis took an odd but beautiful, jewel-encrusted knife, but the sound of nearby war drums had sent him fleeing from the jungle. Now, two years later, and armed with the strength of his three new stalwart companions, Willis returned to the jungle in search of further lost treasure. But what they found there was a fantastic creature guarding the gates to a forgotten city of super-science—a city that was home to a mysterious race of ancient people who were so steeped in social inequity that the slightest social rumble would lead to a bloody revolt!